Article alleging ties between WoW and radical groups disappears from Channel 2 site - but concerns remain. An article pointing to ties between Women of the Wall and radical anti-Israel groups strangely disappeared from the Jerusalem Online News website, where it was first published last week, and then reappeared at the Jewish Press website. The article was penned by Rachel Avraham, a news editor and political analyst for Jerusalem Online News, the English language internet edition of Israel's high-rating Channel 2 News, and reveals ties between Women of the Wall and a number of radical, anti-Israel groups. 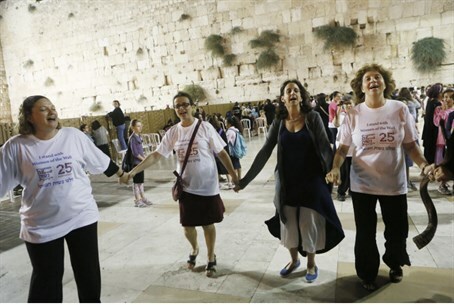 “While Women of the Wall has built up a name for themselves as a feminist organization promoting women’s rights in Israel, their leadership in fact have links to anti-Israel groups that not many people know about,” writes Avraham in the piece. The article goes on to point out that these groups contribute towards the delegitimization of Israel in the world. Adalah was a major contributor to the discredited Goldstone Report and together with Mosawah is opposed to Israel’s right to exist as a Jewish state; Ir Amim runs “highly politicized anti-Israel tours of the holy city, which indoctrinate internationals into holding anti-Israel views,” and Yesh Din views Israel to be an apartheid state, and demonstrated support for Turkey after the Gaza Flotilla incident. Woman of the Wall Chair Anat Hoffman “also happens to be the chair of the Domari Society of Gypsies in Jerusalem,” which is a part of Al Aqsa Grassroots, an anti-Israel network that supports "resistance to the occupation" and is against the "Judaization of Jerusalem," in addition to supporting the Palestinian right of return to Israel, reveals Avraham. Before the 1993 Oslo Accords, she adds, Hoffman was the chairwoman of Women in Black, a group that advocates giving all of Judea and Samaria, as well as eastern Jerusalem – which includes the area of the Western Wall, or Kotel – to the Palestinian Authority. Avraham turned to Women of the Wall for a reaction, and quotes the group's spokeswoman, Shira Pruce, as stating: "Our participants and supporters come from all walks of life, political opinions, and Jewish denominations." But Avraham concluded that, in her opinion "if the leadership is associated with anti-Israel groups, then the organization itself has a hidden anti-Israel agenda." “In my viewpoint, they seek to portray Israel as a fundamentalist anti-feminist country that forbids freedom of worship, thus driving a wedge between the State of Israel and the largely Reform-dominated Jewish American community that does prefer to pray with men and women together, with the women wearing tallits [prayer shawls traditionally worn by men - ed. ]," she explained. "This has the effect of pushing many American Jews away from Israel, thus forcing Israel into a wall, diplomatically speaking." Avraham adds that Women of the Wall have accepted funding from the far-left New Israel Fund, which also processes all donations made to Women of the Wall. In February 2010, the Im Tirtzu organization launched a public campaign criticizing NIF for its grantees' role in promoting the Goldstone Report and their involvement in "lawfare" cases in foreign courts. “While Women of the Wall might deny this makes them anti-Israel, these connections are enough by many people to make them viewed as an anti-Israel organization,” Avraham accuses. Interestingly, Avraham's article first appeared on Jerusalem Online News. Shortly after its appearance there last Tuesday or Wednesday – it disappeared, and then reappeared on the Jewish Press website on Sunday. “However, as journalists, we are committed to share with the Israeli public the truth about political groups operating within our country. There are many well-meaning feminists who support Women of the Wall without being informed of the fact that the organization is led by individuals tied to anti-Israel groups. These women have the right to know the truth before they sign up for such a cause,” she concludes.